In a shot across the bow to his once former ally and supporter in Mayor Dawn Zimmer, the first ward councilman backed up the earlier reports of a major fundraising coup in the first quarter in 2017. 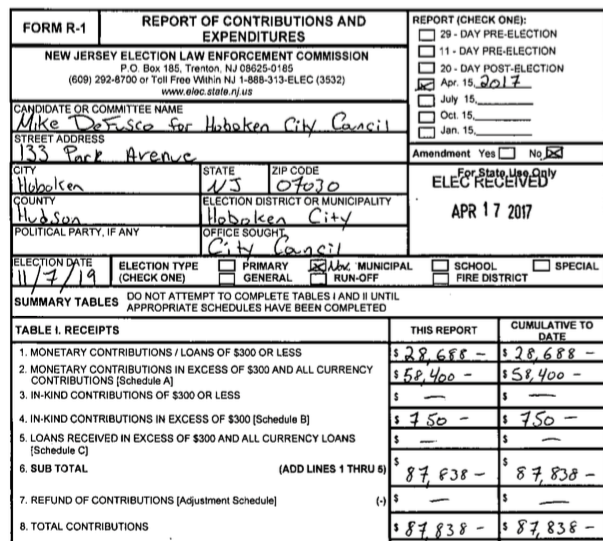 Based on the above original copy filed with NJ ELEC earlier this week, Councilman DeFusco netted $87,838 in the first quarter ending last month. The tally likely means a face-off will be expected this November for the mayor's seat and three at-large council seats. The results of the November election will hold major consequences for Hoboken governance. Talking Ed Note: Monies from inside and outside Hoboken are seen in the report. Resident James Vance gave $1,000 but many other individuals mostly outside the Mile Square gave larger amounts. 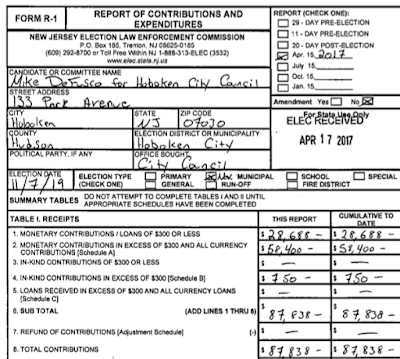 NJ LGBT offered $500 and Union Local 169 gave $1500. Among local business, realty with the union are represented among numerous people who live outside Hoboken with Jersey City represented with several individual donors. Unrelated: The Clerk's Office lost the case earlier today on the Democratic Committee late filings in favor of Peter Biancamano and Ines Garcia Keim. The Old Guard is counting this as a victory since their 2-1 district uptown candidates will be unopposed on the ballot. The candidates however will not be allowed to be slotted under Phil Murphy and the mayor's Democratic committee candidates on their line. No legal fees will be paid either. Some conclude the massive legal filing by well known lawyer Steve Kleinman meant this was another Beth Mason action. BoE trustee Sheillah Dallara and her husband Aaron are bumped off the ballot as a result. When Hoboken was "Delivered Vacant"